The Andy region has a long tradition in such ritual activities. Ancient Incas had a prophesy saying when their gods star touches the peak of the mountain due to star sky rotation their world would scramble destroyed by conquerors. Thus they tried to stop rotation of the stars in the sky with every year human sacrifices. They hadn’t succeeded the stars continued their courses and eventually Cortes’s conquiscadores came and destroyed their empire. If they adapted on the unavoidably forthcoming they could succeed but preventing of natural course of things cannot work. The described shamanic practice against the natural evolution of the mountains instead of adaptation won’t work too. Dear Mr. Gold: In this world, we obey the laws of thermodynamics! I must say that at least Eduardo Gold is walking the walk instead of trying to push his views on everyone else, so I say good on him. So here’s an open challenge to any AGW fanatics. Stop whining about it and head over to peru and give this guy a hand. In fact head over to all the areas of the world with Glaciers and get painting. Let the rest of the world get on with doing something productive. I say 200k to get the AGW fanatics outside and to stop their whining, bluster and misinformation is cheap. I would easily add a few more 0s to that figure. They should have hired the IPCC for the job – they are internationally recognized for their whitewashing! I’d reflect on this some more, but who the hec tares? This is going to make it tough for any dark skinned humans. Watch out Dr Pachauri! Add the above to Adolfs human sacrifice at comment #1 and I’m sure there will be lots of environmentally concerned ultra right wingers making the next suggestion. Soldiers have been painting rocks white for years, usually as punishment though. Could this be how we’ll get our ‘green’ jobs though? Presumably the inventor couldn’t think of a faster and more effective way, like a few water bombers. If they’re using genuine whitewash, may even be able to sell CO2 offsets. This is abit off topic but how are ever meant to take the Obama administration seriously on any environment issue if the following is correct. Does this fall into the same category as painting rocks white ?? Jo – are you sure this isn’t a hoax? You have pointed out that washing the rocks won’t make any difference to the snowline, but there’s also the CO2 generated in calcining the limestone (CaCO3)to lime (CaO). That consistes of CO2 released by the fuel used to “burn” the lime plus the CO2 released from the limestone itself. We would also need to consider the energy required to transport the “artisans” and their jugs of water to that level. It has minimal scientific or logical basis. It is done by spending other people’s money. It purports to achieve “sustainable” gains but only generates ongoing welfare applications. It actually achieves nothing besides some good publicity. It must be a hoax. Either that, or the warmists DO have a sense of humour! We could do our bit- perhaps paint Ayers Rock with aluminium paint? Or float a sheet of alfoil on the Barrier Reef? All our highways could be painted white with black lines up the middle? Hey, it can’t hurt, especially if there’s a grant in it. This just seems like “cargo cult” science, which seems to be increasingly popular within supposedly educated cultures. GREEN JOBS AHOY! Move to Peru and get in while the gettin’s good! Great article and confirmation if it were needed that wind power is extremely expensive when it is generating and dearer still when it’s not. According to David Archibald, a solar scientist, we are due for a twenty year period of substantial cooling to the extent that Canadas wheat belt will be shifted several hundred kilometres to the South. We may be asked to generate more CO2 to help grow crops in cooler climes. Yesterday on talkback a number of callers were describing how to beat rising electricity costs they had moved back to wood fuelled stoves, heaters and hot water systems. These units were popular in the fifties and sixties. So in order to reduce CO2 the government raises electricity costs but the clever consumer reverts to wood and or coal. $200 worth of wood could save some $1000 worth of electricity. A real no brainer. I think he should go for it, paint away. As another commenter said – at least he is willing to walk the walk even though it’s pretty misguided. This is what is used in whitewash along with some more chalk for good measure. Now admittedly the whitewash extracts some CO2 from the atmosphere as it cures after application, in essence reversing the first reaction, but there was quite a bit of energy spent producing the whitewash and getting it up to the Andes in the first place. Maybe they can increase tourism by preteneding this is a major art installation. These cretins must be taking drugs!!! Don’t forget to put up a few windmills and solar panels while you’re up in the mountains! What an incredible waste, the IPCC could have put that whitewash to much better use. Whether they decide to do it again or not, it won’t affect the climate. Dumb greenies – it’s almost a tautology, isn’t it? I wonder what a bad idea looks like? How nice of the UN to yet again be so thoughtful and frugal with OUR MONEY. Are there no lengths these selfless worldly beurocrats will go to save us? They could be spending all their time and energy to line their own nest eggs, instead, they’re toiling in low paid, unappreciated worldly ventures. God bless their kindly souls. You made that up didn’t you???!!! They should have considered the total environmental impact of this publicity stunt. 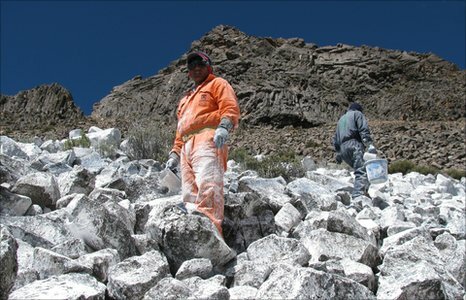 Pouring alkaline whitewash over the stones and onto the soil isn’t good for the local flora (lichens and cyanobacteria, if nothing else at that altitude). I see more glacial voodoo science at work, here. Methinks Mr. Gold is guilty of plagiarism. Obviously, he stole that idea from Mr. Maxwell’s Demon. I’m pretty sure that if you consulted the Material Safety Data Sheet (MSDS) for lime, the handling instructions would recommend rubber nitrile gloves, goggles and waterproof apron to be worn when working with this stuff. As you mention, this stuff is corrosive! Pity the guys sloshing this around on the Andes rocks have none of this – not even brushes! How is whitewashing a mountain going to make it snow? Where’s their environmental impact statement for slopping caustic solution all over the mountains? Whitewash won’t change the ocean circulation currents that respond largely to cloud albedo, dragging the moist air currents closer to or further from the Andes. They’d do better by urinating in the snow, making it wet and packing it so that the dry winds don’t sublimate the remaining snow back to water. And they could enjoy an immediate sense of relief. Eduardo Gold looks old enough to have watched Monty Python. At $5000 per capita there would be plenty of takers for a slice of the World Bank booty. Good luck to ‘em. I’m still double checking that it’s not April Fools Day. You can buy soda lime to take out CO2. The machines also have a CO2 cannister to make sure you don’t intake pure O2. You will die if you have no CO2 in your bloodstream. Supersticious people have long claimed influence to weather by calling on spirits and gods as part of their religious practice. That is one way to have power over people. Black people, consider this fair warning not to go to Peru. You and your heat trapping skin color will not be tolerated. Institutionalized racism is OK if it “saves the world”. Is it a coincidence that this same agenda is also cutting off any chance that developing cultures in Africa will never be allowed to realize cheap affordable electricity? Is it a coincidence that Bono wins humanitarian awards for his efforts to promote AIDS (junkscience) awareness from which Africans are sterilized by powerful antiretrovirals as a result? I think I see a pattern here. Before any more of you take up these “bleeding heart” causes, keep in mind that it’s mostly black peoples’ hearts doing the bleeding. We can make them promise to wear white hats. Should be OK. Keeps the Mexicans nice and cool. Seriously though, this exercise is not the big waste of money that you all think it is. This is an attention-grabbing exercise designed to get some photographs into magazines and eventually move some extra foreign aid dollars. Think of it as budget allocated to advertising helplessness. Have your fun guys (some are pretty funny! ), but whitewash could solve global warming — it’s just a matter of applying it where it matters. As Anthony Watts has shown, if the weather service would go back to whitewashed Stevenson screens for its weather stations, all of the last century’s warming would disappear. And it wouldn’t take near as much whitewash as painting the Andes. The World Bank recently lent South Africa $3.8 bn to build the 4th largest coal station in the world. Now that is spending which is truly misguided. The claim that the snowline is 4,900 m is nonsense, that is only a regional average. Local conditions like albedo influence that elevation. And a glacier existed on that spot in times past. It fed streams the local people relied on for irrigation, drinking and livestock for many generations. The project doesn’t have to completely restore the glacier to be successful. If they can expand the snowfield and/or slow the melt rate by 1-2 months, that would restore a longer irrigation season. The people might be able to stay on their lands and in their homes, instead of being impoverished and forced to move into Lima’s slums. And a glacier existed on that spot in times past. It fed streams the local people relied on for irrigation, drinking and livestock for many generations. Glaciers neither create nor destroy water. They are long term water storage, but not in a form that is useful to humans. Snowfall higher up the mountain is what provides water for communities. The project doesn’t have to completely restore the glacier to be successful. If they can expand the snowfield and/or slow the melt rate by 1-2 months, that would restore a longer irrigation season. 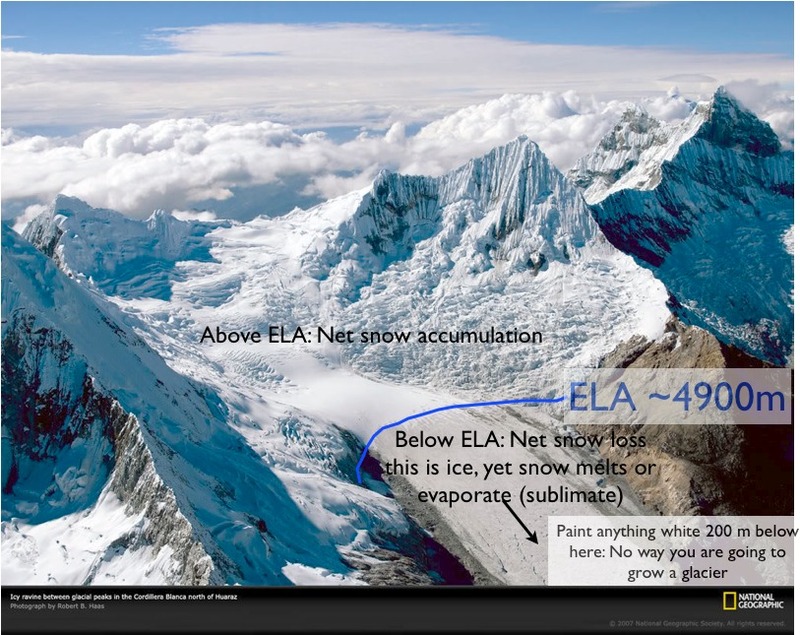 Seasonal snow melt is quite a different issue to glaciers. Seasonal snow does provide water in a form that is useful to humans, but you might have noticed that seasonal snow is in fact white already, after the snow has melted away to expose the white rocks it doesn’t matter much anymore. Maybe the white rocks could encourage it to snow more in that area, but this would only be important if the existing moist air was likely to blow away from the mountains and fall over the ocean — seems highly unlikely. The people might be able to stay on their lands and in their homes, instead of being impoverished and forced to move into Lima’s slums. Ignorance and whacky off-beat projects are not going to help those people. They have had enough water mismanagement already. The best way to have water storage is to build dams. Works everywhere else in the world. So, “Eduardo Gold” is the Spanish transliteration of “Tom Sawyer”…? A few months from now I wonder if they’ll get problems from all this lime leaching into rivers and lakes. More insane eco-engineering. True story I heard from a US Navy ship’s commander was that he would engage the sailors by having them strip down the ship and repaint it in the usual Navy gray. And when that was done? The whole process was repeated just to keep them busy! I just want to call to your attention that according to a Harvard University physicist a typical web search on a desktop computer generates about 7 grams of carbon dioxide. Thus, performing two searches is comparable to bringing a kettle to boil, according to a report Sunday in The Times of London. While that may not sound like a lot, the report notes that Google handles about 200 million searches daily. The global IT industry generates about 2 percent of global carbon dioxide emissions, or about as much greenhouse gas as the world’s airlines, according to a recent Gartner study cited by the newspaper. Tell no to Google. Use green search engines such as queuSearch or Ecosia which provide a much faster and cleaner alternative to using Google. Please take a look at green search engines and start reducing the carbon footprint of your web searches.